The TS 75L model fogging machine mainly design used for spray water based chemicals, used for farm, poultry, cattle house disinfection, green house plants protection.etc. We install the automatic Ignitor to the machine, it is automatic ignition for start up, so the client only need pump the machine, the machine will automatically start up. We install 3 lTheayers protection shield and 2 stages cooling system for the machine, when the machine working, so make the machine have plenty of cold air get inside of the fogging tube to cooling down the temperature, so when the machine working, the temperature of the fogging tube only around 30 degree Celsius, it make protect the user and help keep the efficacy of the chemicals, it is the unique design in the world, no any other supplier have this advantage. 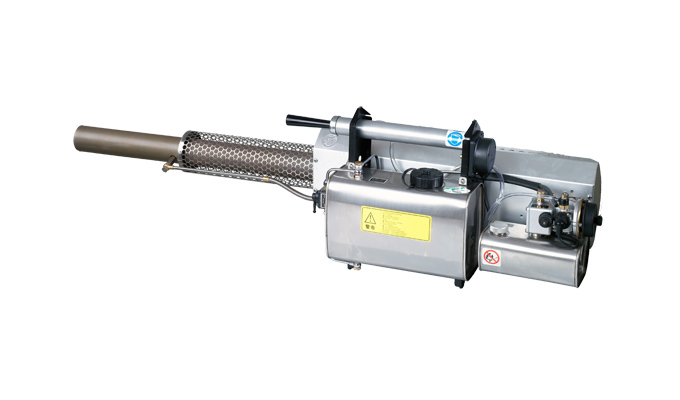 The TS 75L model fogger has also been manufactured using high grade stainless steel, providing the user, with years of durability and performance. It is easy to carry, just wearing a trap, you can take it around.